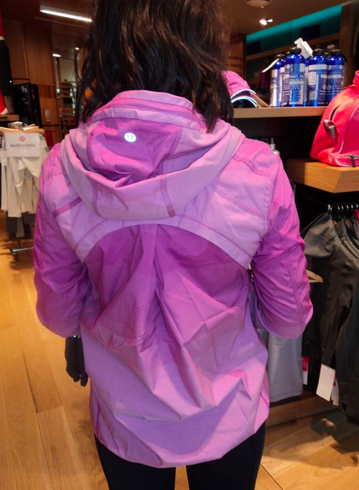 I’m really loving the Downtime Jacket in Violaceous but I really can’t justify it since it’s not exactly a running jacket. What’s lacking in it for running is the reflective stripping which is an essential for me for running in. Also, I think the silhouette of the jacket is a bit to voluminous and my preference for running jacket is a sleeker less wind catching design. Actually, normally I wouldn’t use a run jacket unless it’s quite cold out or quite wet out so once the weather warms up enough that I’m not using my Hustle Jacket I will be opting for my pullovers and Swiftly long sleeves with my vest over top. Luxtreme, Running Luon and Swiftly all behave quite well in very wet weather so this would not classify as a *need* for me anyways. I’m very sad to pass on this one since it’s such a gorgeous to and from jacket but as always, there is something else I love as much just around the corner. I’m thinking since I’m so sore about passing on the Power Purple Swiftly long sleeve that I wont let myself miss out on the Violaceous one. "New Jacket! The Aura Jacket ~ Updating Post"